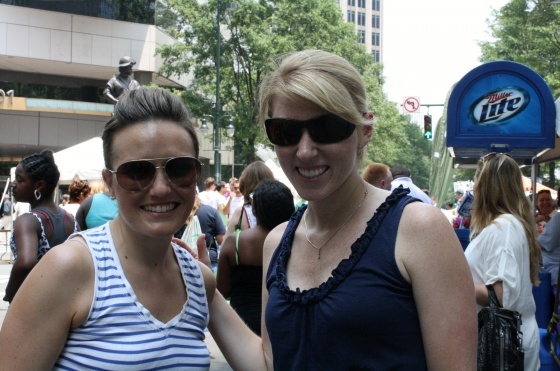 On Saturday, I met Brittney and Jen to go to Taste of Charlotte for lunch. 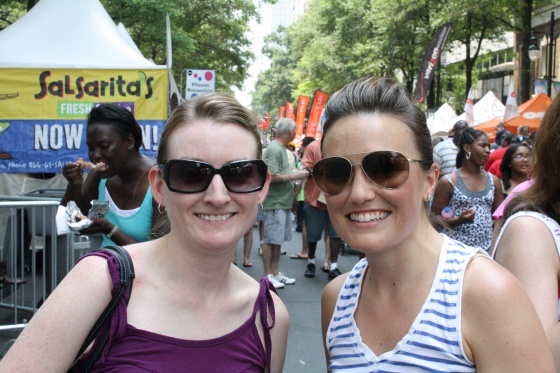 Taste of Charlotte is a three day event held in Uptown Charlotte (my neighborhood) that features food vendors and food-related vendors. There are some free samples but most of the food is for sale. Everything costs 1-3 tokens, which you purchase from coin stations. This was my second year attending the festival. You can read about my first time attending here. 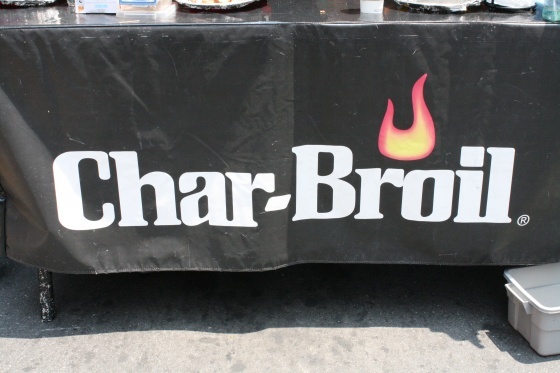 The first thing we did upon arriving was head over to the Char-Broil/Flatout tent. 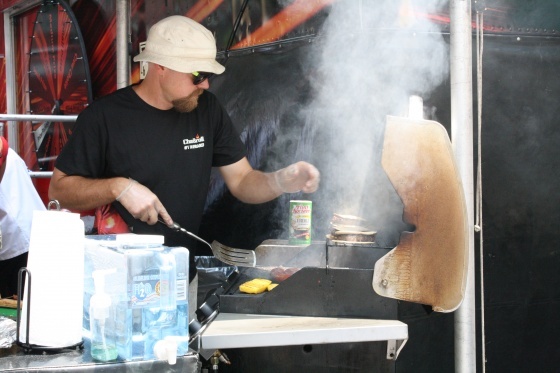 The food on the grill smelled amazing. We each enjoyed a little free kelbasa. It was soooo good. I was starving at this point. 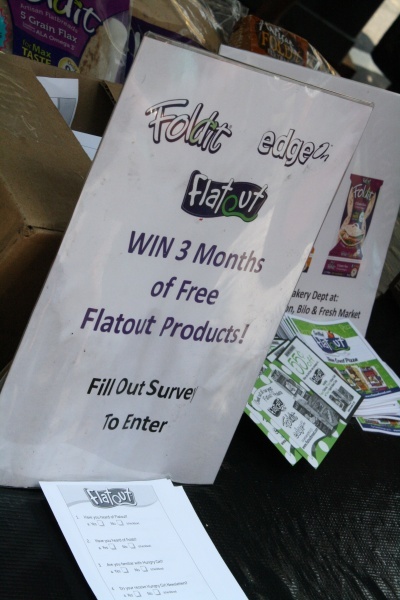 There are a lot of prizes to be won at the various tents like this opportunity to win Flatout products for three months. 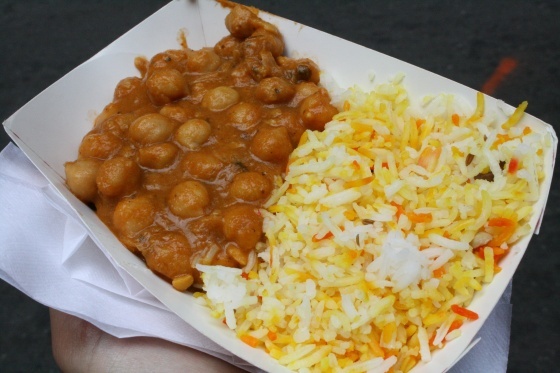 After thinking over all my choices, I chose chana masala from Woodlands for lunch. 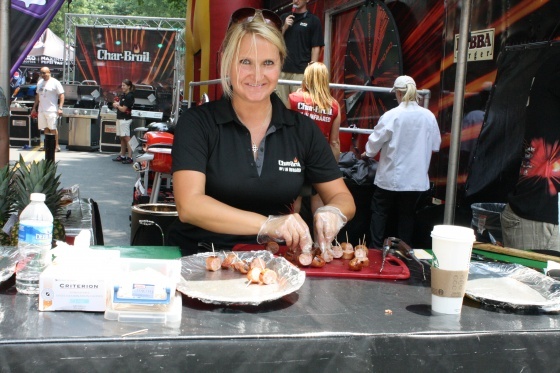 I tasted Brittney’s last year and liked it better than my lunch, so I didn’t want to miss out on it this year. 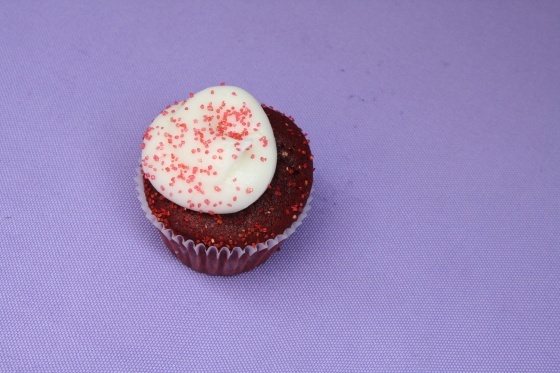 …and this precious mini red velvet cupcake from Polka Dot Bake Shop. I think everything miniature is precious, don’t you? It was delicious and moist. By then, we were hot and jonesing for something cold and creamy. 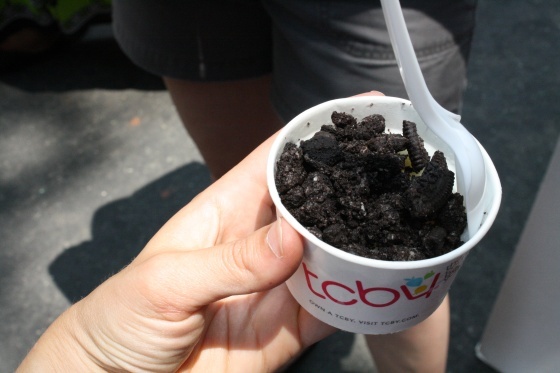 We swung by the TCBY tent and each got white chocolate mouse fro-yo with one topping. I chose crushed oreos as my topping. After fro-yo we were ready to leave the festival because it was so incredibly hot. 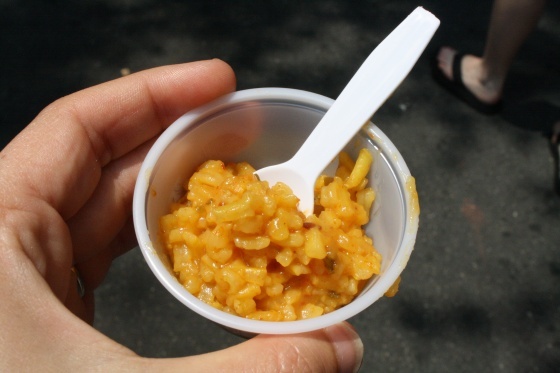 Taste of Charlotte is a fun experience, but I think I would like it even more if the portions were smaller so you could literally “taste” more. There were so many yummy options and I wanted to try them all. 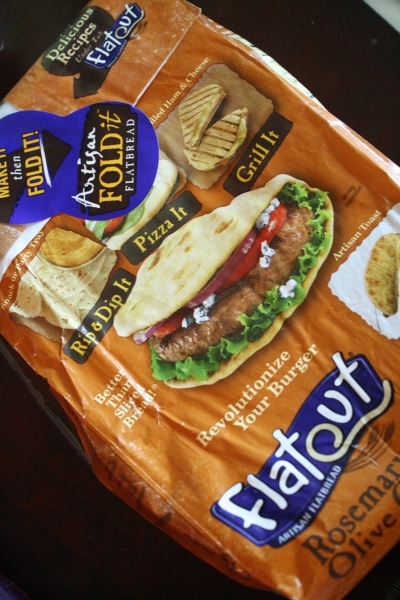 Speaking of “trying it all”, did I mention that Flatout seriously hooked me up this week? 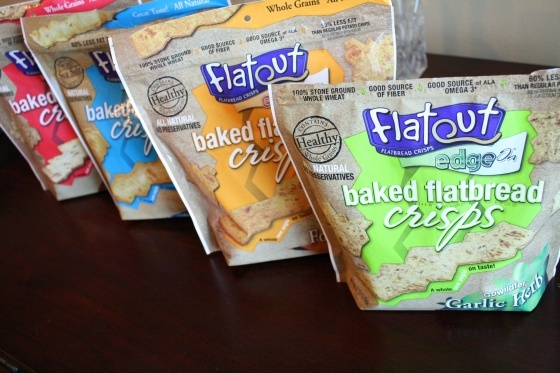 I received four different flavors of baked flatbread crisps. Can you tell we’ve already dug into the Garlic Herb? Part cracker, part chip; Brad and I both really like them. I also like that they have 60% less fat than most potato chips. We’ve been enjoying them with hummus and pimento cheese. Shocker, right? 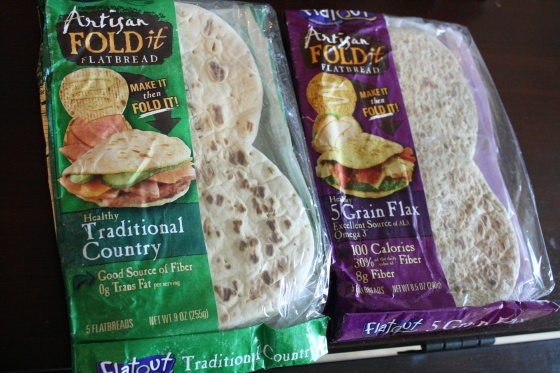 I have yet to try the other products beside the original wraps I have purchased in the past, but Brad made a pizza yesterday with the rosemary olive oil artisan fold wrap and thought it was really good. 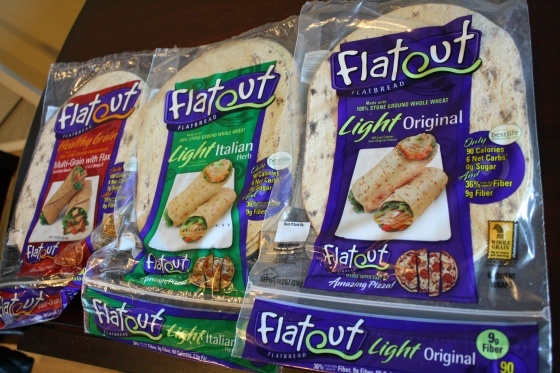 …three different types of the traditional Flatout wraps: multi-grain with flax, light Italian herb, and light original. I’m hoping these freeze well because I think it’s going to take me a couple of weeks to go through them. I think these will be my go-to lunch bread for a while, but I also might make some breakfast wraps as well. This is definitely not the last time you’ve seen these products.